Update: English edition 'Resident Evil 6 Artworks' is out. 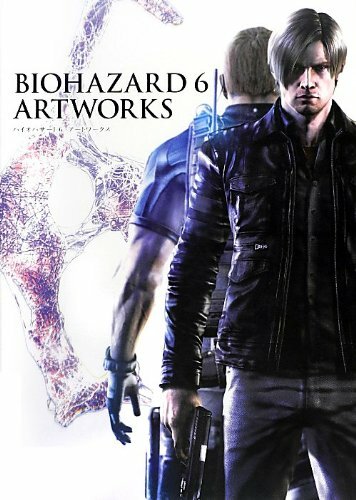 Here's the artbook for Resident Evil 6, also known as Biohazard 6 in Japan. Its a 272-page paperback, thicker than the Biohazard 5 Official Art Works that I reviewed before. Everything's written in Japanese. The book features character designs, weapons, zombies and monsters, and some background art. There are more pages devoted to characters and enemies. Character designs come with lots of concept art and sketches, a 3D model, various costumes and accessories. Cool stuff but the highlight is definitely the zombie and monster designs. Biohazard probably has of the more grotesque enemies compared to other games. There are creatures with all sorts of unnatural growth, burnt skin, bad skin, pus, mutation and other ailments. They are scary looking. The environment art are wonderful, very atmospheric and suited for the game. There are many pieces but printed a bit too small for the details they have. Oh yeah, all the art in the book are pretty detailed. Overall, its a great book, more for those who're into creature designs and fans of the game. Any word of when are they releasing this book in english? There won't be any English edition unless Udon or other publisher translates it.